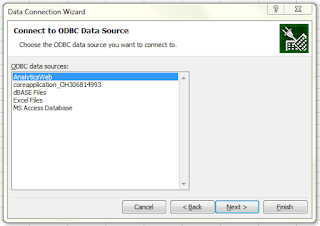 I am using ODBC driver to connect to the BI server. 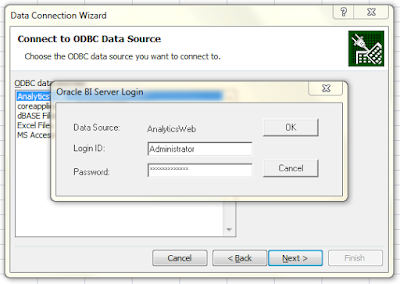 Presentation server also uses ODBC to connect to BI Server. 9. Got the following message. I must point out that excel has ways to refresh data at a set frequency. It can create a number of beautiful charts, graphs etc. If you are good at writing scripts in excel, then you can work wonders with this technique. 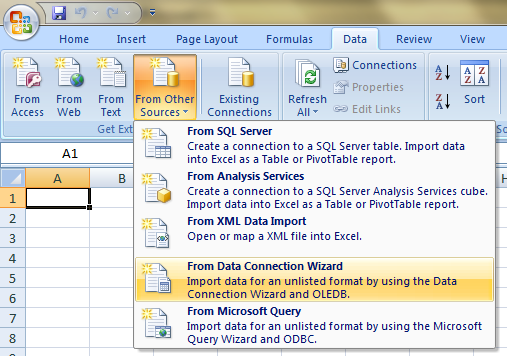 If you want to get an OBIEE answer with OBIEE's formatting in Excel then you can generate the .iqy file for it. 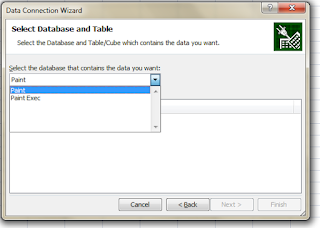 Option to generate the iqy file is under the advanced tab in an OBIEE answer. .iqy file opens in excel and downloads the answer with OBIEE's formatting in excel, after connecting to the presentation server. The mechanism listed here connects to BI server. 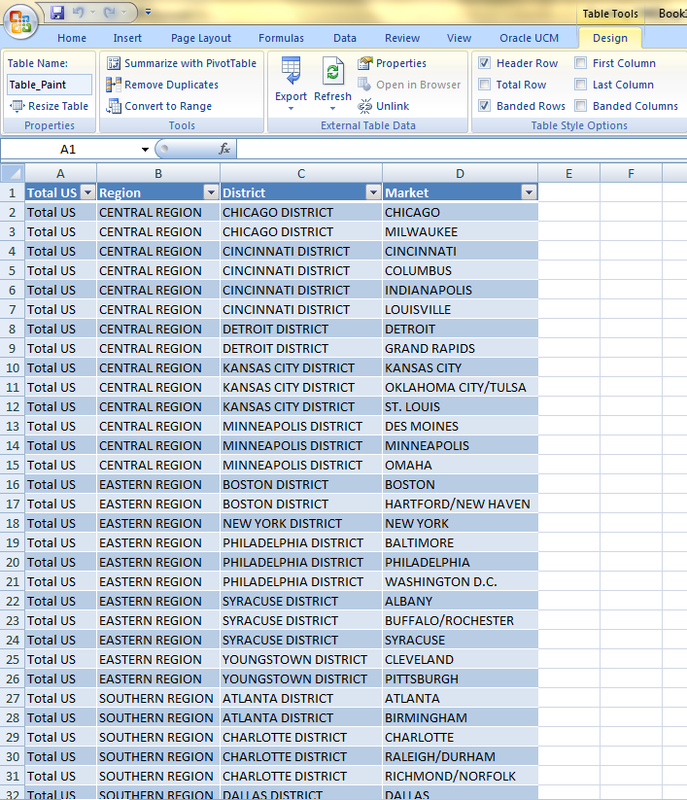 When I am trying this mechanism, I am getting an architecture mismatch error on the data sources screen of excel. I have windows 64 bit. I did it this windows 7 which is 64 bit. Follow the exact steps mentioned in this post. You will get some unfavorable messages and I have pointed those out. This mechanism does not involve a lot of technical stuff. It just connects to BI server and the rest is done in BI server. So your 1st check should be that your BI server should be up and running. Start your presentation services and see if you can run your reports. 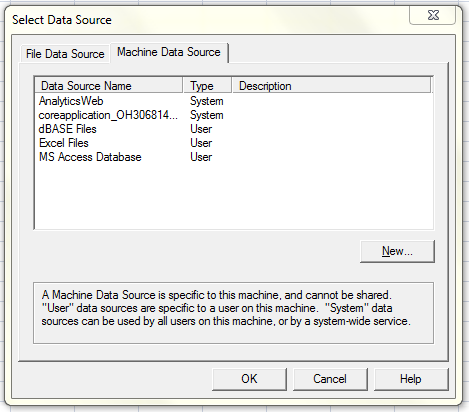 The above command will tell you whether you are able to reach your BI server from the machine which has MS Excel on it. If this works then you are just missing one of the steps mentioned in my post. When I try to connect via Excel I am stuck at step #2. 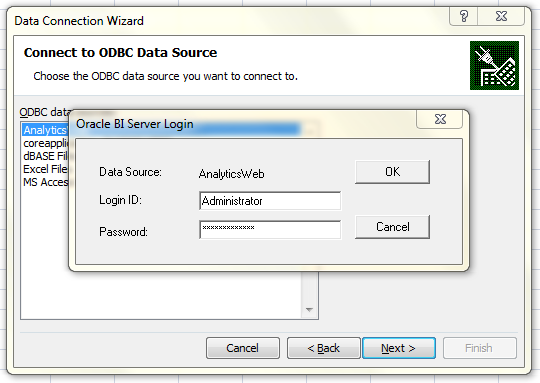 I choose ODBC DSN and then a particular ODBC DSN, but no dialog window appears to input credentials. Double click nor Next button simply doesn't work. 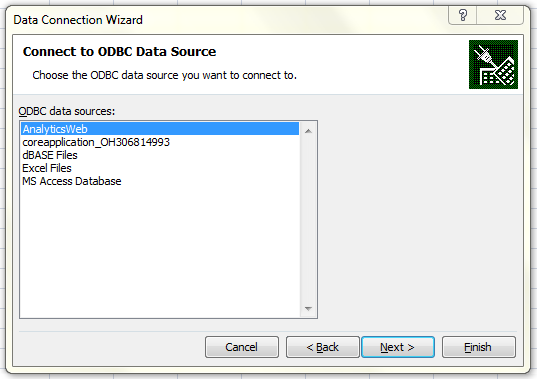 I tried to choose Other/Advanced instead of ODBC DSN and then Microsoft OLE DB Provider for ODBC drivers. Then I am able to choose a particular ODBC DSN, put down credentials and test connection. It says connection is working. And can even choose a catalog from the presentation layer of a repository. But next OK leads to the failure: Unable to retrieve the list of tables. Then it brings me to the previous screen with credentials. 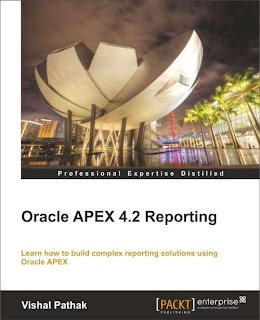 I checked the Oracle support knowledge base and didn't find anything related. 1. We are doing it on OBIEE 11G (11.1.1.5). 2. We are creating the connection from excel but using VBA (Visual Basic). 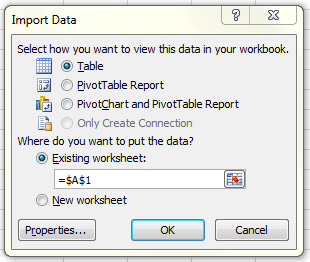 Until now we are having excellent results (We are creating reports and consulting info from BI Server from excel). The only thing that we want to change is the creation of DSN. 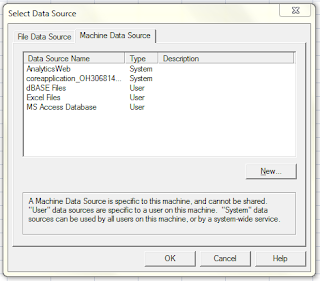 Because we have installed the admin tool, we can make use of the drivers that come with it to create the DSN in the ODBC administration tool of windows. But our final goal is to be able to create the DSN without having installed the admin tool. Our question for you is ¿ Is there some way to get the drivers or an installer of those ? I wish, I could help. I haven't started working on 11G yet so cannot really present a solution for you. 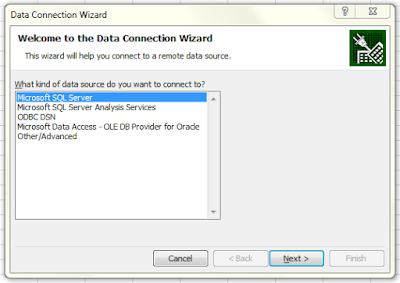 I wonder is there is some kind of Advanced installation of the Admin tool in OBIEE 11G which lets us selectively install the components of 11G client. Atleast this kind of thing is there in the 11G database server.